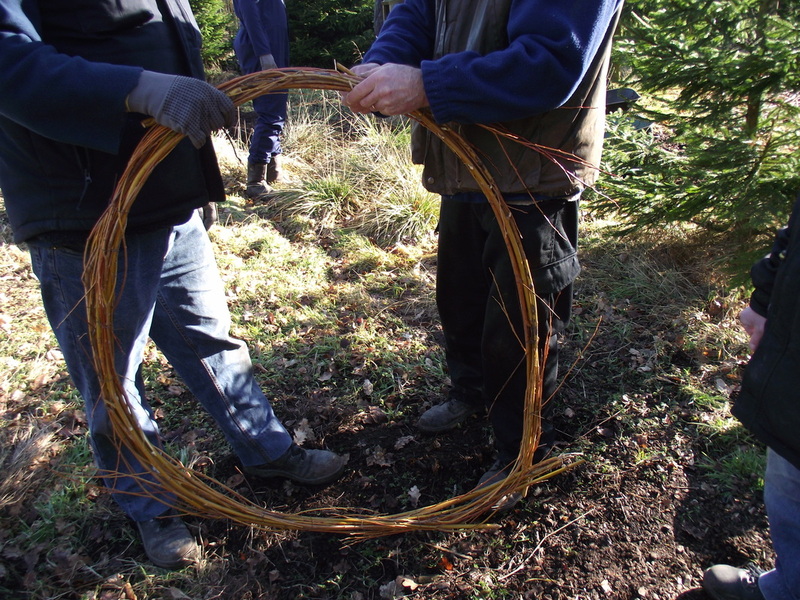 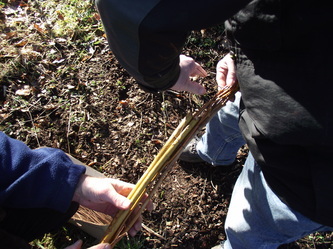 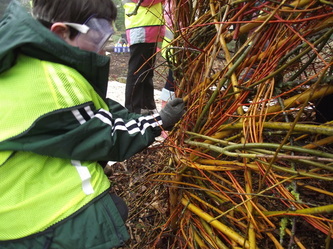 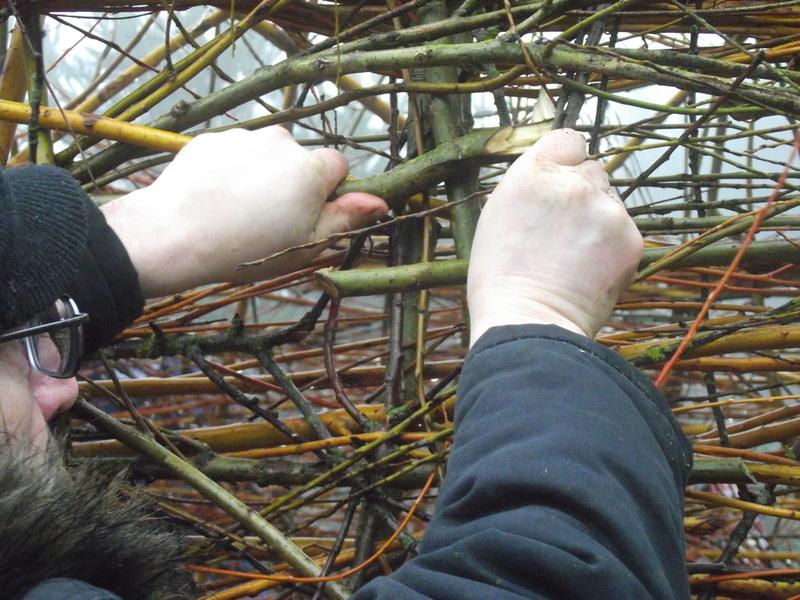 Beckwithshaw Primary School Workshop - I invited some of the pupils from the local school to spend the afternoon weaving more willow into the den at Horticap. 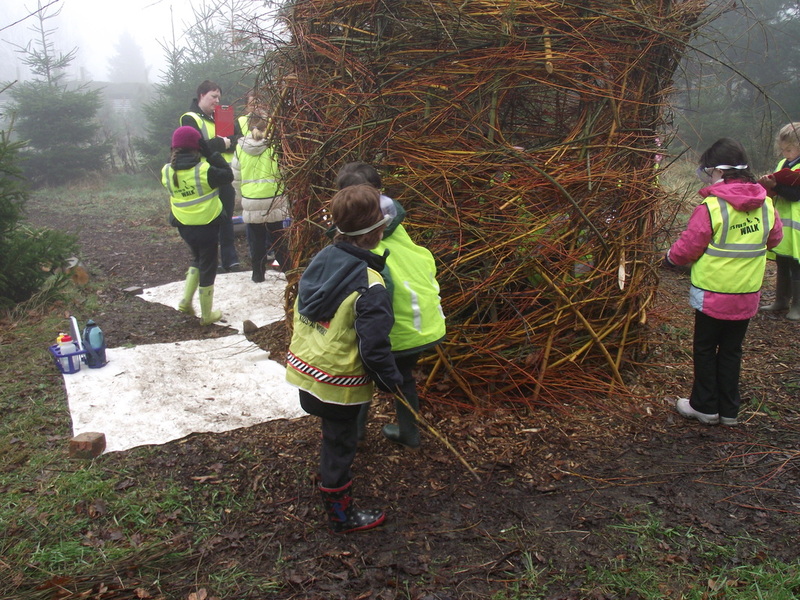 Although the weather was pretty miserable they had a great time. 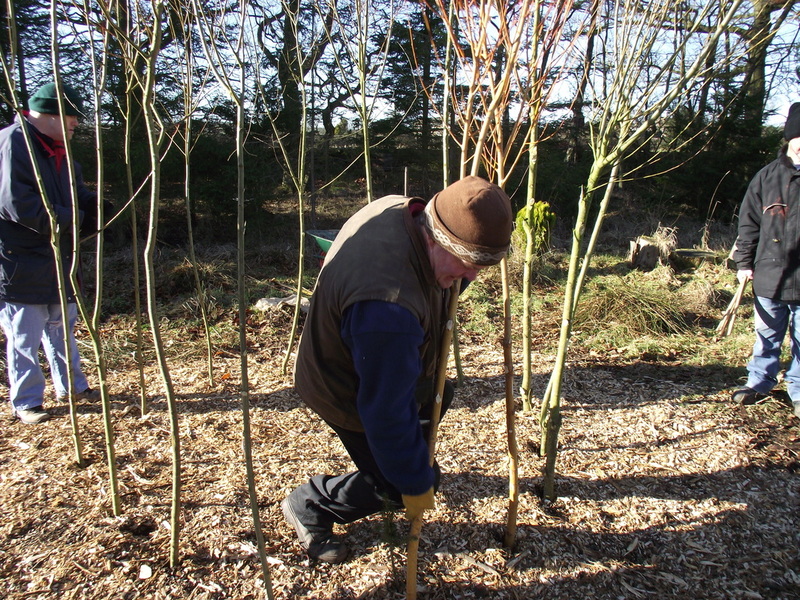 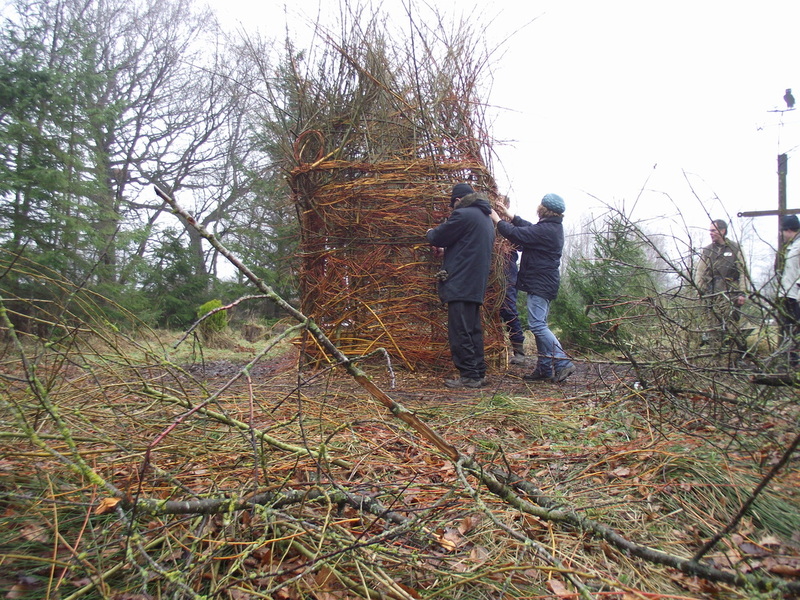 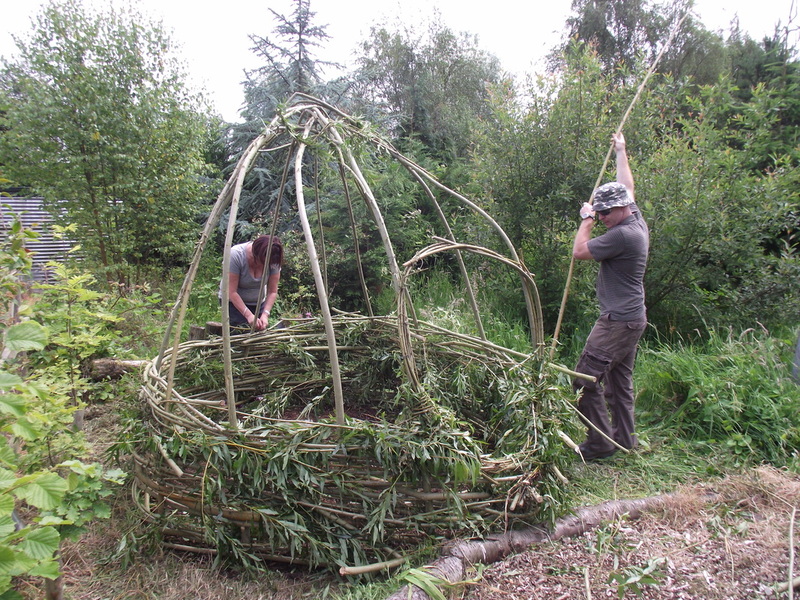 The pleasure they experienced collecting the willow, and physically adding to the structure of the den was for them a rewarding experience. 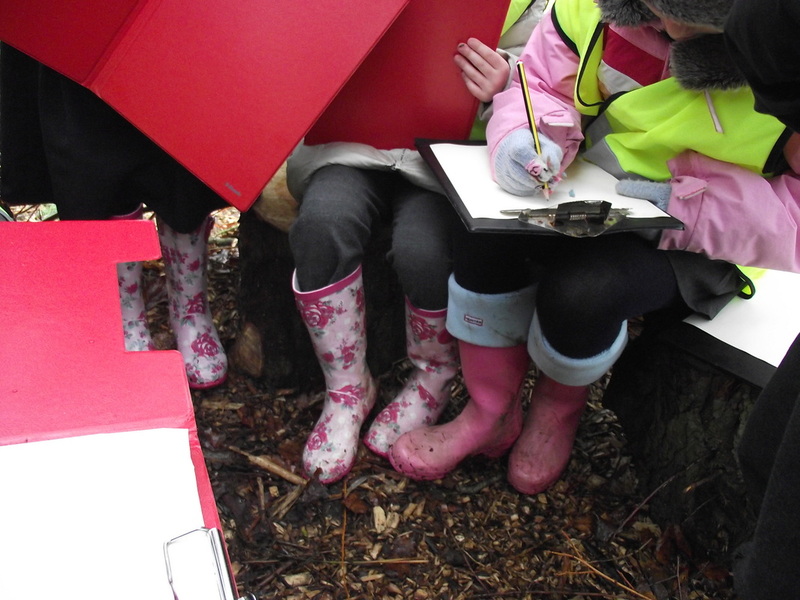 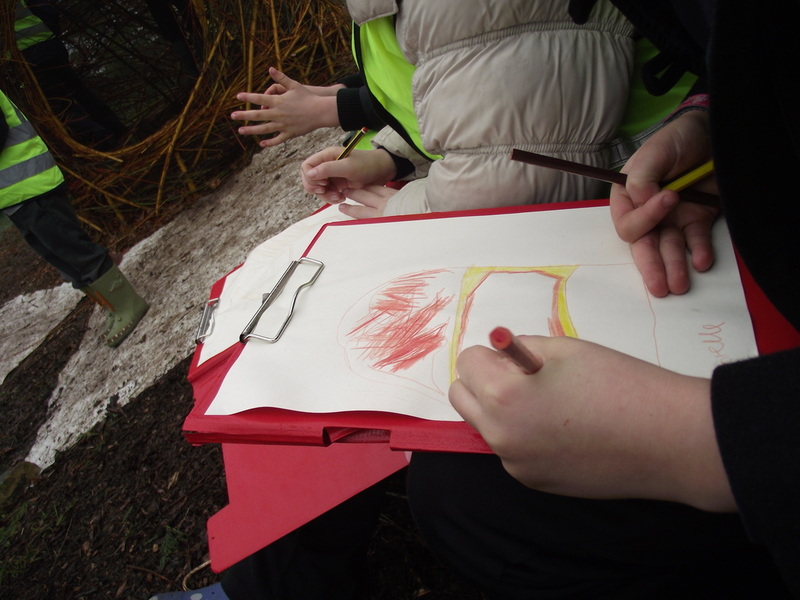 They also drew the den and collected ideas as part of their ongoing project of 'Habitats'. 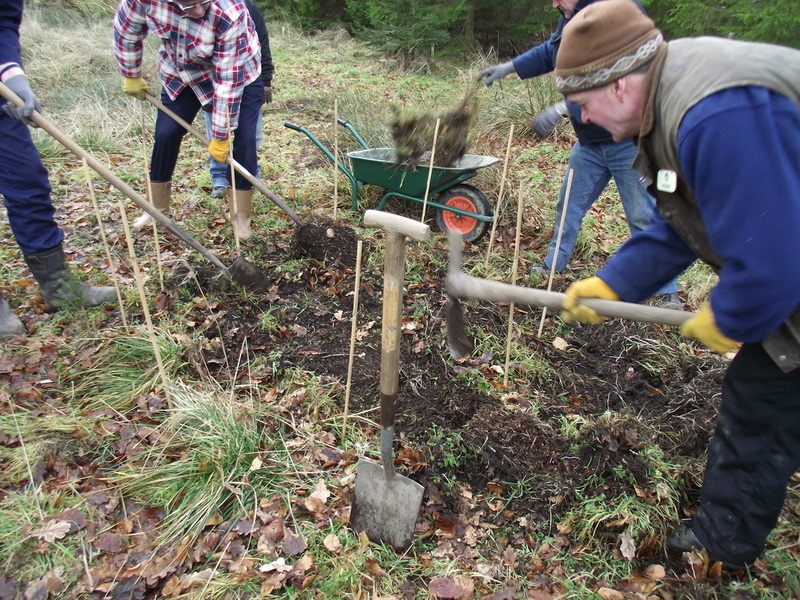 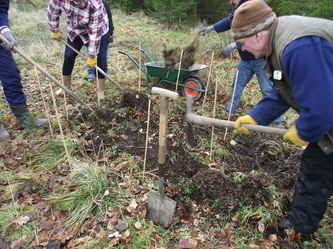 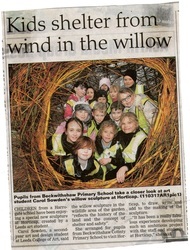 Photographs were taken by the local press and the event was published in the local press. 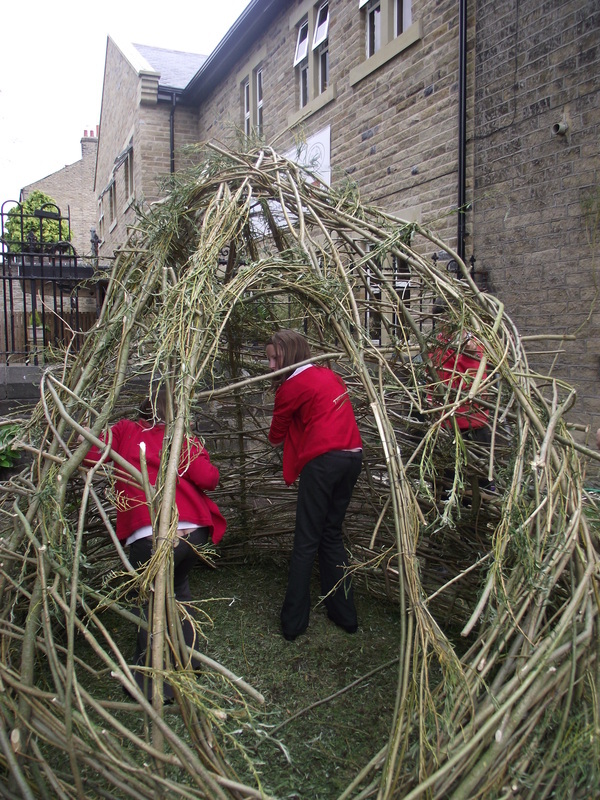 Brougham School Arts Festival - I was commissioned to make a den with year 10 & 11 within the grounds of Brougham Primary School. 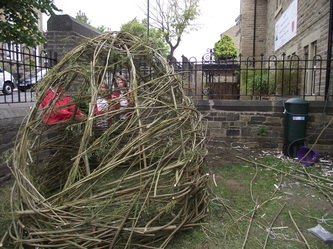 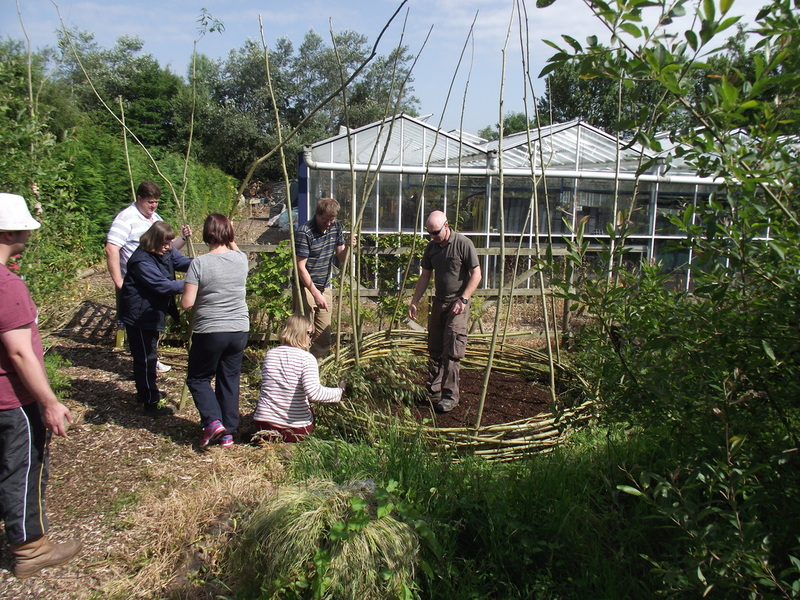 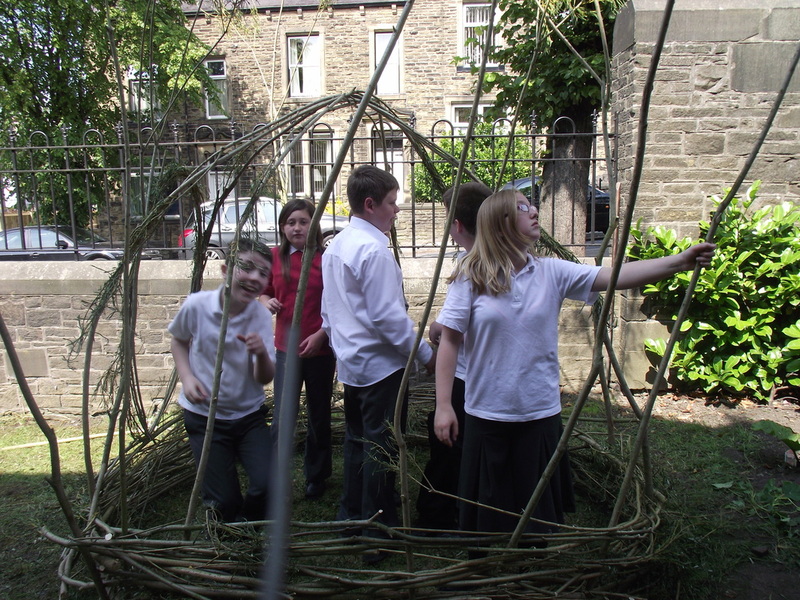 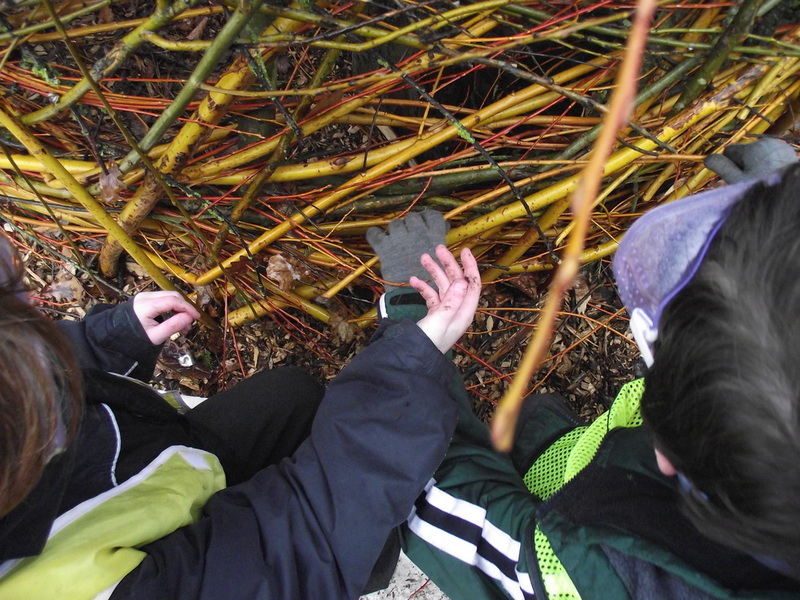 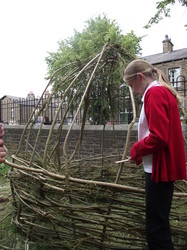 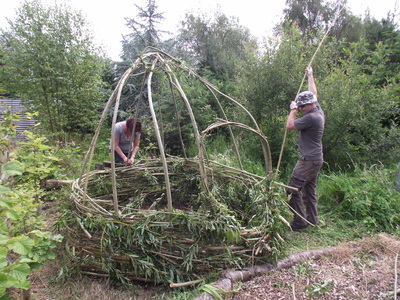 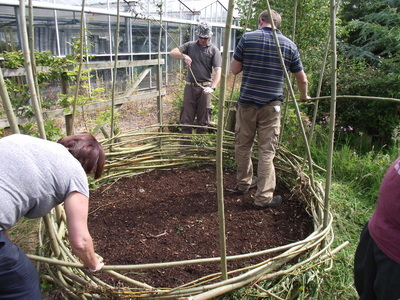 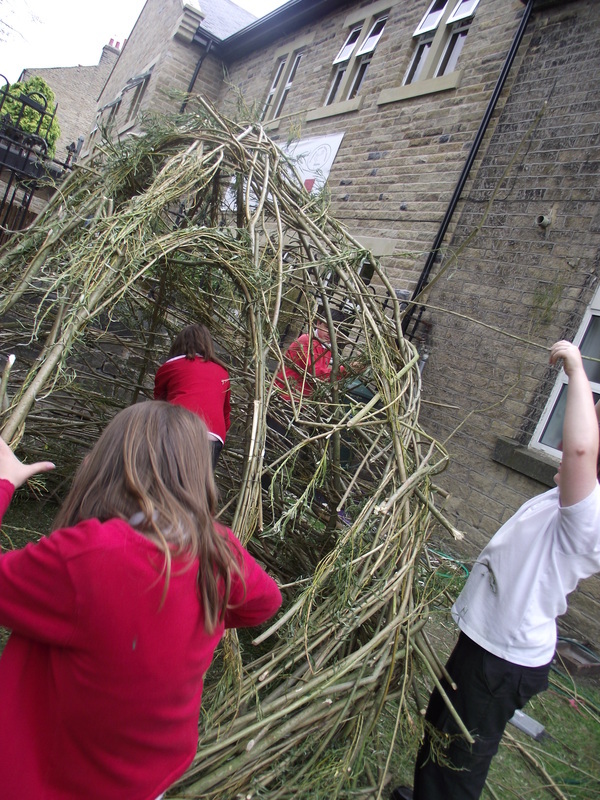 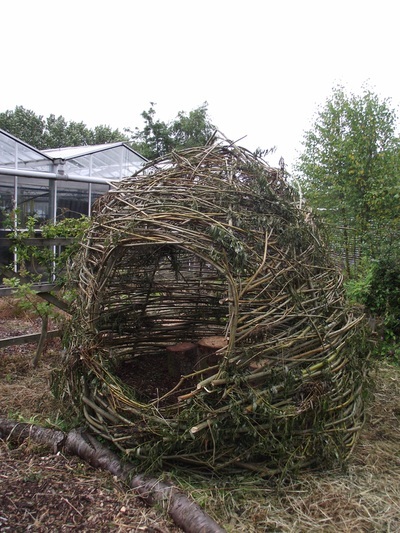 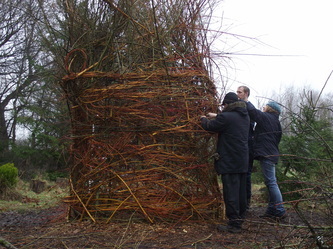 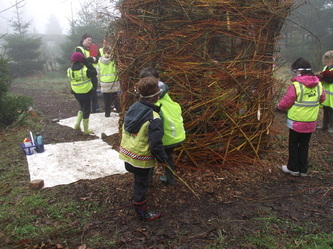 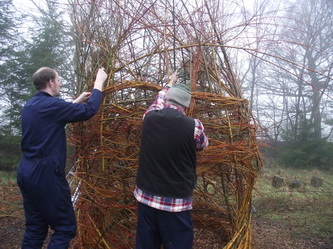 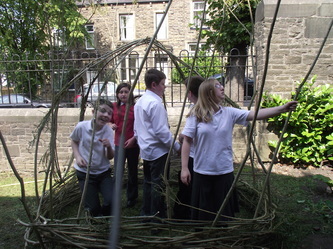 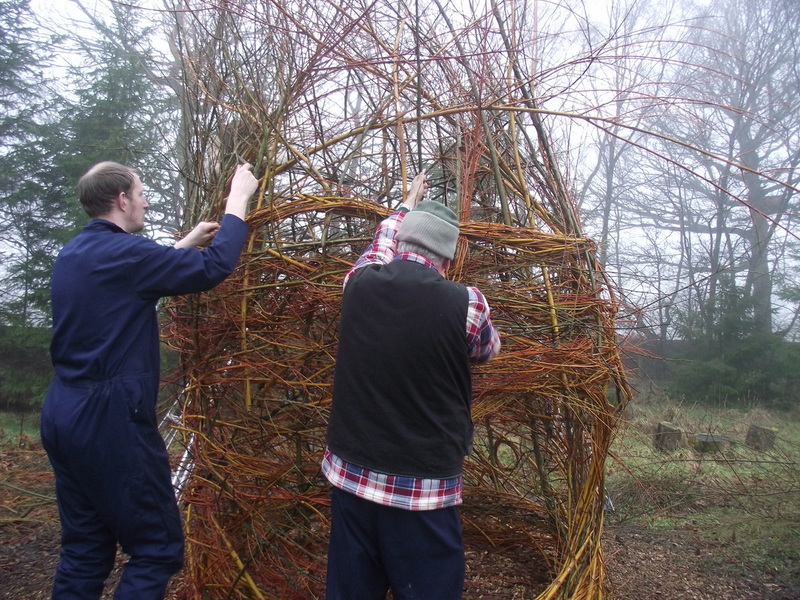 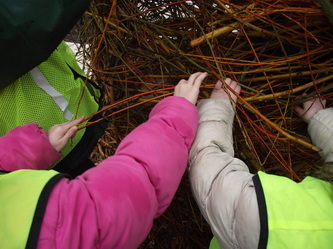 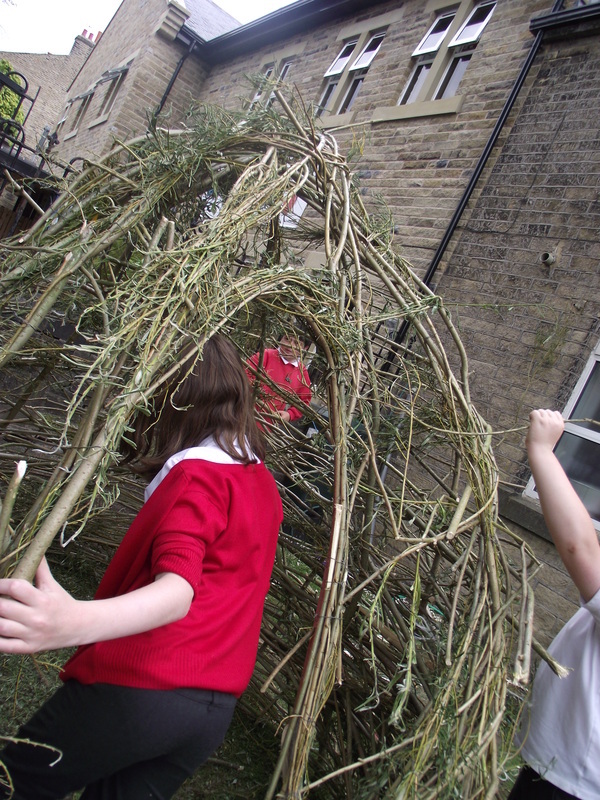 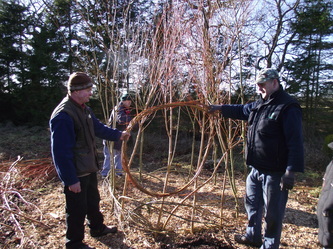 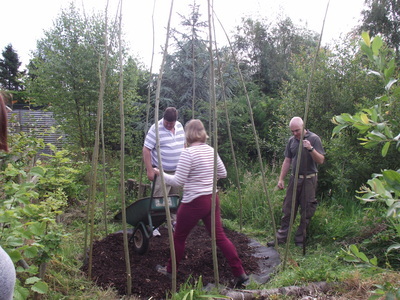 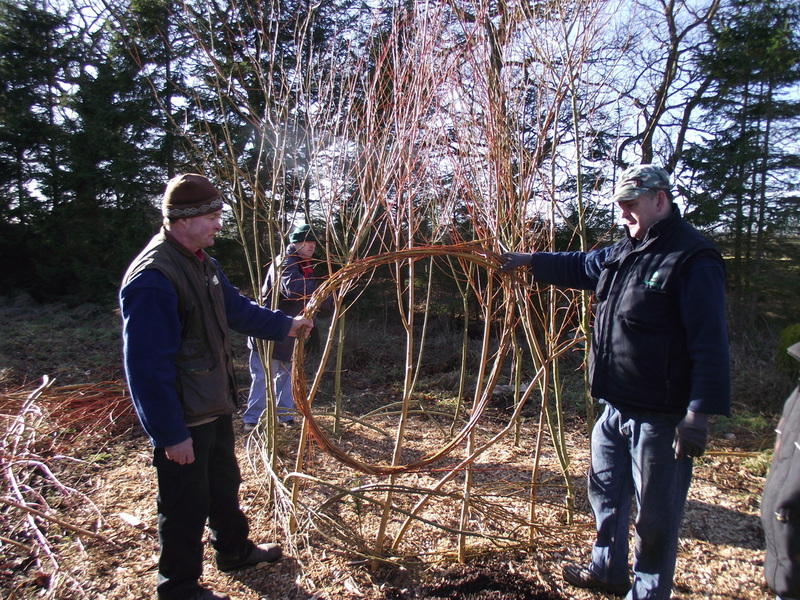 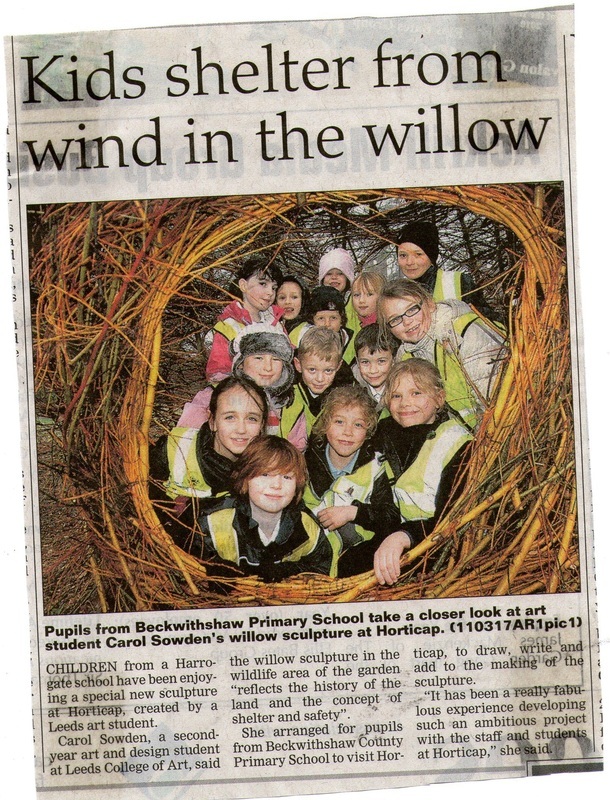 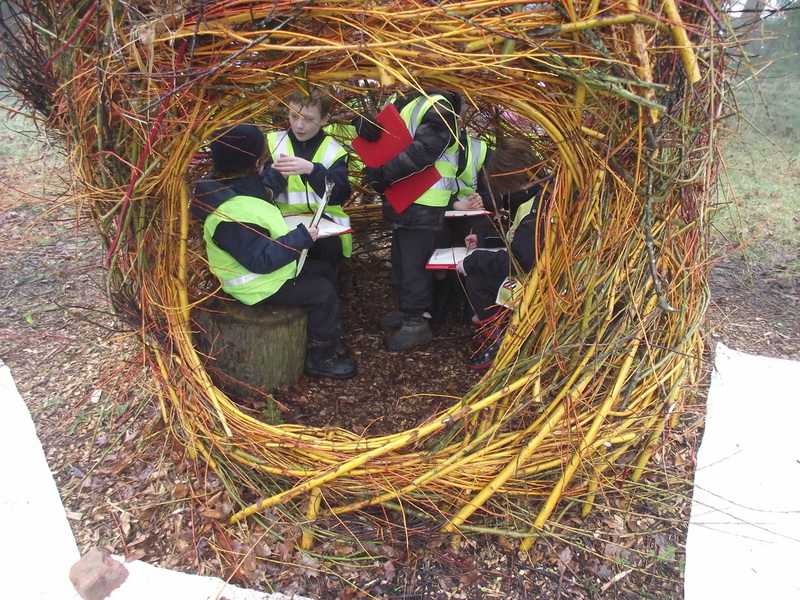 Situated within small garden frontage the pupils created a simple pod like willow form. As the den began to grow in construction the children became excited about what they were constructing and at the end of the day they were really excited about what they had produced. The team work and physical act of making this den gave the children a real sense of achievment. The den remains at the front of the school and a reminder to Year 10 & 11 of their accomplishment, something to enjoy and talk about for a long time to come. 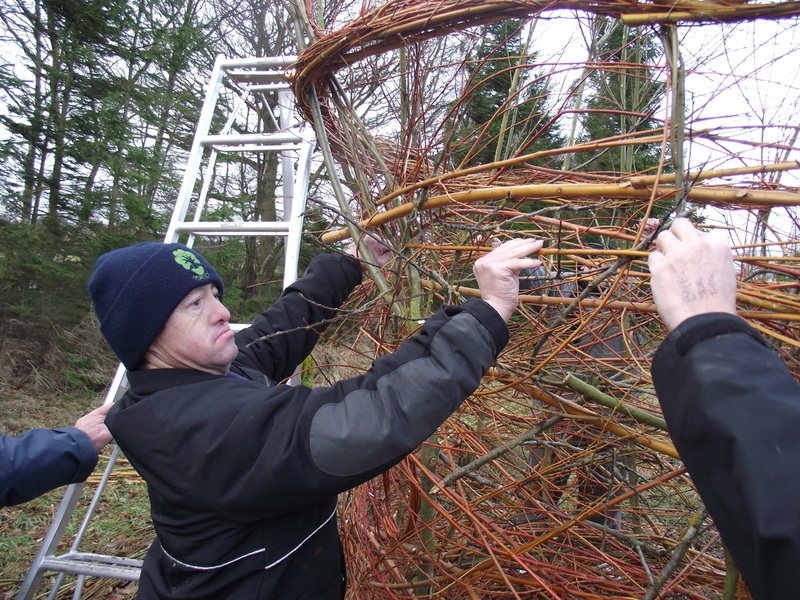 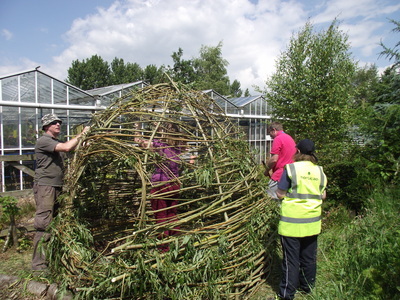 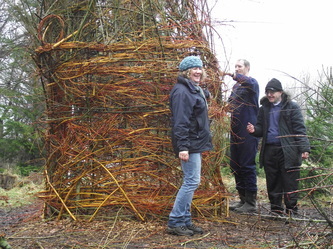 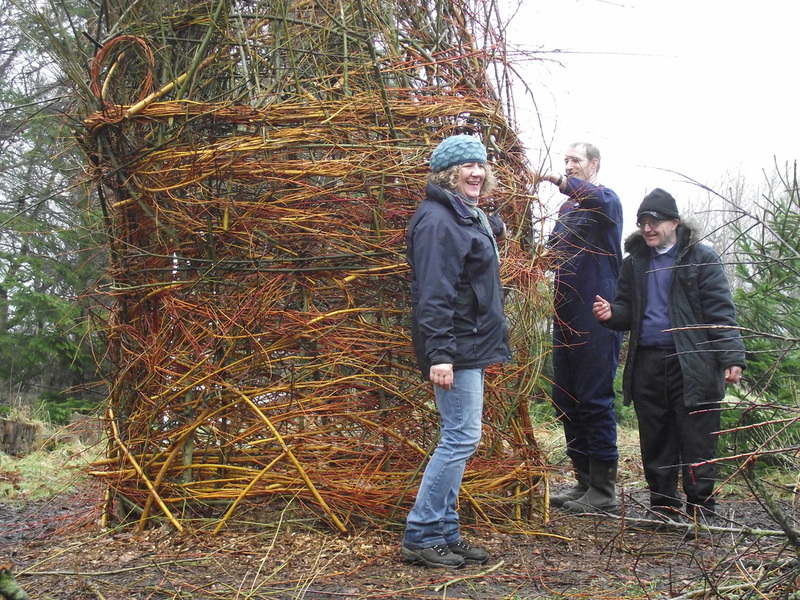 Horticap Project- I designed and propsed the building of a willow den within the grounds of Horticap, a small nursey and garden centre for people with learning difficulties. 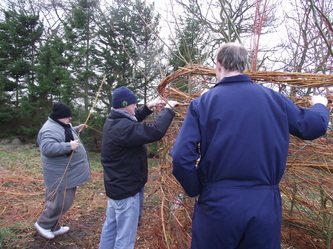 Leading the project myself and Andy Lawrence , one of the instructors, worked with the students to build this large form. Taking around 2 days the den gave great opportunity for the students to interact and work as part of a team as well as gain knowledge of the process of making and experience two days of enjoyment! 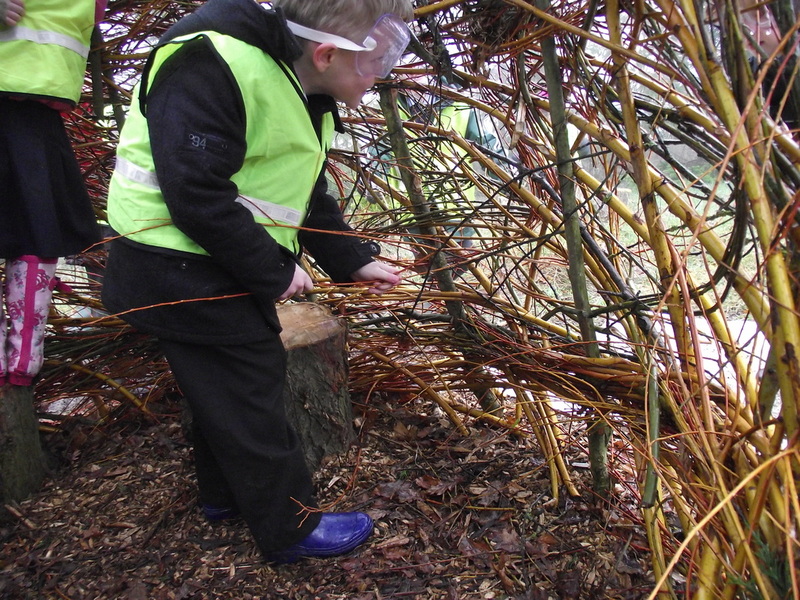 The shelter and safety aspect of the den is now especially enjoyed by students with Autism.